The continuous exposure of esophageal epithelium to refluxate may induce ectopic expression of bile-responsive genes and contribute to the development of Barrett's esophagus (BE) and esophageal adenocarcinoma. In normal physiology of the gut and liver, the nuclear receptor Pregnane × Receptor (PXR) is an important factor in the detoxification of xenobiotics and bile acid homeostasis. This study aimed to investigate the expression and genetic variation of PXR in reflux esophagitis (RE), Barrett's esophagus (BE) and esophageal adenocarcinoma. PXR mRNA levels and protein expression were determined in biopsies from patients with adenocarcinoma, BE, or RE, and healthy controls. Esophageal cell lines were stimulated with lithocholic acid and rifampicin. PXR polymorphisms 25385C/T, 7635A/G, and 8055C/T were genotyped in 249 BE patients, 233 RE patients, and 201 controls matched for age and gender. PXR mRNA levels were significantly higher in adenocarcinoma tissue and columnar Barrett's epithelium, compared to squamous epithelium of these BE patients (P < 0.001), and RE patients (P = 0.003). Immunohistochemical staining of PXR showed predominantly cytoplasmic expression in BE tissue, whereas nuclear expression was found in adenocarcinoma tissue. In cell lines, stimulation with lithocholic acid did not increase PXR mRNA levels, but did induce nuclear translocation of PXR protein. 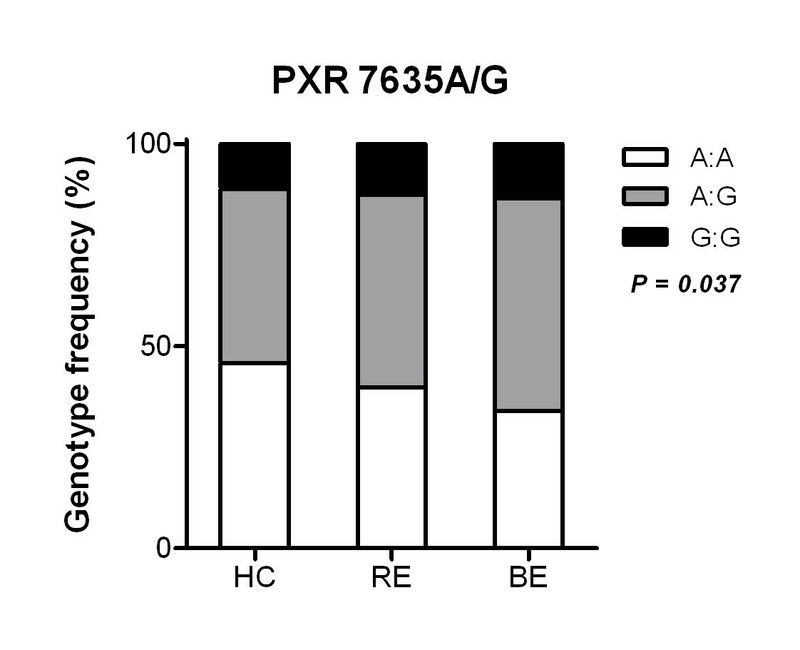 Genotyping of the PXR 7635A/G polymorphism revealed that the G allele was significantly more prevalent in BE than in RE or controls (P = 0.037). PXR expresses in BE and adenocarcinoma tissue, and showed nuclear localization in adenocarcinoma tissue. Upon stimulation with lithocholic acid, PXR translocates to the nuclei of OE19 adenocarcinoma cells. Together with the observed association of a PXR polymorphism and BE, this data implies that PXR may have a function in prediction and treatment of esophageal disease. Persistent regurgitation of gastroduodenal contents into the lower esophagus causes mucosal injury manifested as reflux esophagitis (RE) [1, 2]. As a complication of chronic RE, a Barrett's esophagus (BE) can develop [3, 4]. BE is defined as an acquired condition in which the stratified squamous epithelium of the lower esophagus is replaced by specialized intestinal epithelium . It is the sole commonly recognized risk factor for the development of esophageal adenocarcinoma (EAC) [6, 7] and has an increasing incidence in the Western world . While the importance of acid and bile exposure in the development of BE is well established [1, 5, 9, 10], only a small percentage of BE patients will ultimately develop EAC. It remains largely unclear which factors control the rate of neoplastic progression in BE . A growing body of evidence suggests that the intrinsic adaptive response to the toxic bile acids from the gastroduodenal contents is unable to prevent injury to the esophageal lining, thus suggesting a role for bile-induced signalling in the progression of BE . An important step in understanding the adaptive defence mechanism against toxic substances has been the identification and characterization of the nuclear pregnane × receptor (PXR) [13–16]. PXR belongs to the nuclear receptor subfamily of ligand-activated transcription factors that play a key role in the regulation of biliary transport systems and enzymes that confer a protective role against toxic bile acids . This group of nuclear receptors includes the constitutive androstrane receptor and the vitamin D receptor [17, 18]. In humans, PXR is most abundantly found in the liver, the small intestine and the colon [13, 15, 16, 19]. It is activated by a structurally diverse array of xenobiotics and endogenous compounds, including bile acids and steroid hormones [13, 17, 18]. Variability at the PXR genetic locus is therefore thought to be associated with pathophysiological changes in steroid, cholesterol or bile acid levels . Polymorphisms in the PXR gene are associated with diseases such as inflammatory bowel disease and primary sclerosing cholangitis [20, 21]. As these chronic inflammatory diseases are associated with aberrant bile acid metabolism, there may also be a link between PXR and BE. The specific aim of this study was to explore the expression and distribution of PXR in BE and adenocarcinoma patients and analyse possible associations in the PXR gene with esophageal disease. We show that PXR expresses in tissue of BE and adenocarcinoma patients, and that it translocates to the nucleus in esophageal adenocarcinoma cells upon bile acid stimulation. In addition, a link between PXR polymorphisms and esophageal disease was found. For immunohistochemistry, multiple biopsies of adenocarcinoma tissue (n = 19), columnar epithelium from BE patients without dysplsia (n = 28) and squamous epithelium from RE patients (n = 8) were taken at the same distance from the z-line. As healthy controls we included subjects that had no gastroesophageal reflux disease (GERD) symptoms or endoscopically detected aberrations of the esophagus (n = 3). The number of biopsies taken was approximately four per patient, and varied between one and eight biopsies. For each patient, all biopsy specimens were embedded in one single block of paraffin and were therefore stained and analyzed in one slide. Histologic diagnosis was made by two experienced gastrointestinal pathologists (HD and HV). All patients had specialized intestinal metaplasia and were graded according to the most severe stage found. Cases on which agreement could not be reached or that were indefinite for dysplasia were excluded from this study. Table 1 gives patient characteristics of the population used for analysis of PXR mRNA levels. mRNA levels were determined in a total of 119 esophageal samples, counting biopsies from 11 adenocarcinoma patients, duplicate biopsies of both the squamous and the columnar epithelium from BE patients (n = 21), squamous epithelium of RE patients (n = 7), and squamous epithelium of healthy controls (n = 5) without GERD symptoms or endoscopically detected aberrations of the esophagus. All BE patients had histologically confirmed intestinal metaplasia without high-grade dysplasia. Characteristics of the group included in this study for genotyping are shown in Table 2. The total of 683 genetically unrelated Caucasians included 249 BE patients, 233 RE patients and 201 controls without any history of GERD symptoms, who all visited the endoscopy unit of the Erasmus MC-University Medical Center Rotterdam or the IJsselland Hospital in Capelle aan den IJssel between November 2002 and February 2005 . This study was approved by the institutional ethics review committees, and all patients gave informed consent before participating in the study. The human adenocarcinoma cell line OE19 and human squamous epithelial cell line HET1A were obtained from the ATCC. OE19 cells were grown in RPMI 1640 supplemented with 10% fetal calf serum (FCS), 2 mmol/l glutamine, 100 units/ml penicilline and streptomycin. HET1A cells were cultured in serum-free BRFF-EPM2 medium supplemented with 100 units/ml penicilline and streptomycin. Cells were maintained routinely at 37°C in 5% CO2 humidified atmosphere. After a period of at least 24 h to allow cells to adhere they were stimulated with 10 μM of rifampicine, 50 μM lithocholic acid (LCA), or 50 or 100 μM taurolithocholic acid (TLCA) for 24 h.
Total RNA was extracted from tissue biopsies using TriReagent (Sigma, St Louis, MO) and purified using an RNeasy micro column kit (Qiagen, Hilden, CA). One-fortieth of a 1 μg cDNA synthesis reaction (iScript cDNA Synthesis Kit; Bio-Rad) was used in a 25 μl Real Time-PCR using SYBR GreenER (Invitrogen, Carlsbad, CA). The following primers were used for PXR gene amplification: 5'- ATGGCAGTGTCTGGAACTAC-3' and 5'- CAGTTGACACAGCTCGAAAG-3'. Duplicate samples were run three times in independent PCR runs and the average level of PXR was normalized to GAPDH using the ΔCt method . Formalin fixed, paraffin embedded, five μm sections were mouned on glass slides. After deparaffinization in xylene and dehydration in alcohol, endogenous peroxidase was inactivated by incubation with 1% hydrogen peroxidase in methanol for 20 min. Microwave pretreatment in glycin-HCl/EDTA buffer (50 mM Glycin, 10 mM EDTA, pH 3.5) was performed for 10 min. After treatment with 10% normal human plasma/10% goat serum to block non-specific antibody binding, sections were incubated overnight at 4°C with a rabbit anti-human PXR antibody (diluted 1:200, clone poly6169; Biolegend; San Diego, USA), followed by a biotin-labeled mouse anti-rabbit IgG (diluted 1:200; Dako, Glostrup, Danmark), and streptavidin-horseradish peroxidase (diluted 1:300, Dako) and visualized with diaminobenzidine. Nonspecific background controls were done by omitting the primary antibody and an isotype control was included. Samples of the terminal ileum served as a positive control. Sections were evaluated at a 200- and 400-fold magnification using light microscopy (Axioskop 20, Zeiss) by two independent observers (AW and KZ). At least 100 cells were counted in representative areas of longitudinally sectioned crypts in BE cases or high power fields in adenocarcinoma cases. For quantification only cases with nuclear protein expression were considered PXR positive, with cases evaluated as positive for PXR when more than 2% of counted cells showed nuclear positivity of PXR protein. Cells were cultured on coverslips washed with phosphate buffered saline (PBS) and fixed with 2% paraformaldehyde for 10 min. After washing, cells were permeabilized with 0.2% Triton ×100 for 20 min and then blocked with 5% goat serum and 5% normal human plasma in PBS with 5% BSA. Cells were incubated with mouse IgG or anti-hPXR antibody (1:200; Biolegend, San Diego, USA) at 4°C overnight and then probed with 1:200 dilution of goat anti-rabbit Alexafluor 594 (Invitrogen; Oregon, USA). Hoechst 33342 was used to stain nuclei. Coverslips were mounted onto glass slides with gelvatol and visualized under a Zeiss LSM 410 laser-scanning confocal microscope (Zeiss, Oberkochen, Germany). Genomic DNA was extracted from 5 ml of whole blood by a wizard genomic DNA purification kit (Promega, Madison, USA). We analyzed polymorphisms -25385C/T, 7635A/G, and 8055C/T as these should be informative for eight PXR polymorphisms and were observed by Zhang et al  to have an effect on PXR function in humans. Assay validation setup was performed by K-Biosciences (Herts, UK) before performing a double blind analysis of PXR SNPs with a competitive allele-specific PCR system using primers designed in flanking region of the SNP located at -25385; TGGTCATTTTTTGGCAATCCCAGGTT[C/T]TCTTTTCTAC CTGTTTGCTCAATCG at 7635; AGGAGCCATCCTCCCTCTTCCTCTC[A/G]CCCCCAA CTTCTGGATTATGGGATG and at 8055; GCTTGCTGAGAAGCTGCCCCTCCAT[C/T]CT GTTACCATCCACAGGTGGCTTCC of the PXR gene NR1I2. The study was powered (80%) to allow detection of a 10% difference in genotype distribution of the PXR polymorphisms between the groups by performing Chi-square analysis. Odds ratio (OR) and 95% confidence interval (95% CI) were calculated by risk estimate analysis. All statistical analyses were conducted using SPSS v11.0 (SPSS, Chicago, IL) and two-sided significance was taken as P < 0.05. PXR mRNA was determined by Real-Time PCR in a group of 44 subjects with different esophageal pathologies (Table 1). As shown in Figure 1A, levels of PXR mRNA were found consistently higher in columnar tissue compared to matching squamous tissue (P < 0.001), in which levels of PXR transcripts were barely detectable. Figure 1B shows interindividual differences in PXR expression between RE, squamous and columnar epithelium of BE, and EAC. 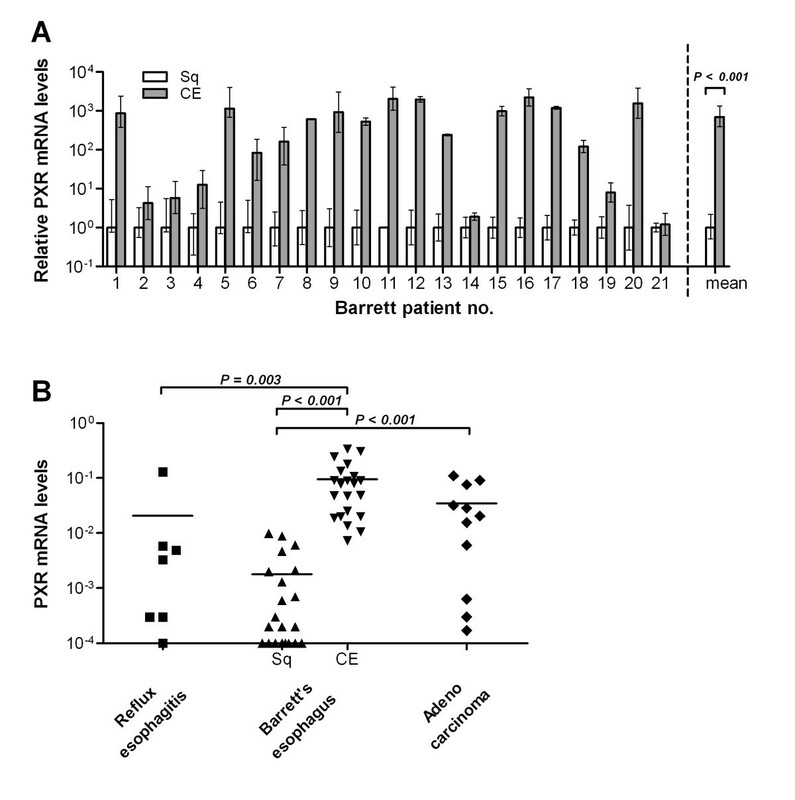 The levels of PXR mRNA in the BE columnar epithelium were higher than in squamous epithelium of RE (P = 0.003, Figure 1B) and healthy controls (P = 0.002, data not shown). Also PXR gene expression in tissue of adenocarcinoma patients was significantly higher than in squamous samples from BE patients and healthy controls. Comparing RE with controls, only one patient showed a strong increase in PXR mRNA and thus overall difference in mRNA levels between these two groups did not reach statistic significance (Figure 1B). Relative mRNA levels of PXR in esophageal epithelium as determined by quantitative Real-Time PCR. (A) PXR levels in columnar epithelium (CE) are normalized to adjacent squamous epithelium (Sq) using 2(-ΔΔCt) method  and are plotted for each of 21 Barrett's esophagus (BE) patients. Error bars express a range which is a result of incorporating the standard deviation into the calculation. The mean of this population renders a strong significant increase of PXR mRNA levels in CE compared to Sq of BE patients (P < 0.001). (B) PXR mRNA levels are calculated using 2(-ΔCt) to show interindividual differences in PXR expression in RE, BE, and EAC patients and plotted on a log scale. Levels in Sq from patients with reflux esophagitis, and patients with BE are lower than in CE derived from the esophagus of BE patients (P = 0.003 and P < 0.001 respectively). mRNA levels in tissue from adenocarcinoma patients did not differ statistically from CE of BE patients, but was significantly higher than all Sq tissues. The detection limit for this assay was 0.0001. 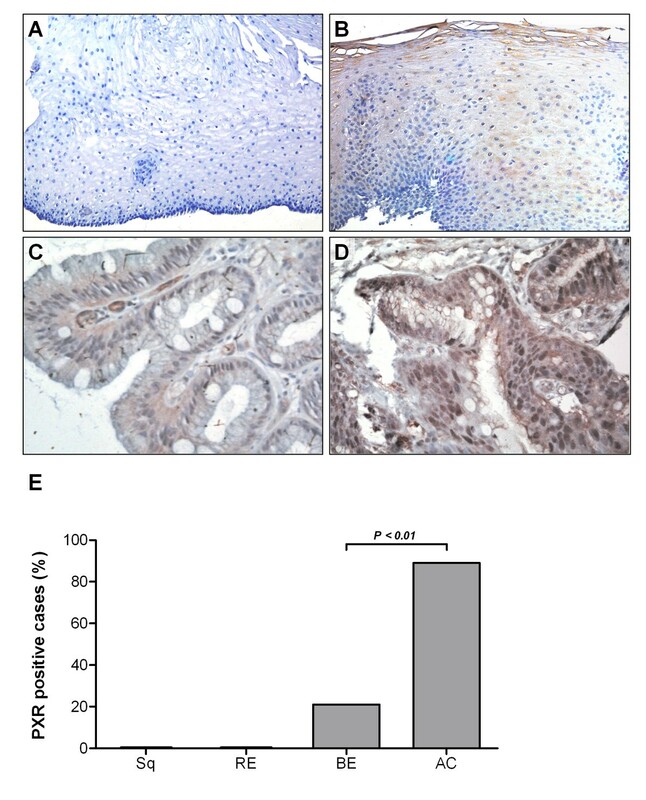 To test if the presence of PXR mRNA corresponded with the expression of PXR protein, esophageal biopsies of 39 patients were stained for PXR by immunohistochemistry. Figure 2 depicts representative stainings of PXR on esophageal biopsy specimens of healthy controls, and RE, BE, and adenocarcinoma patients. None of the normal squamous esophageal samples (n = 3) stained positive for PXR (Figure 2A). Also, no specific PXR signal was detected in RE samples (Figure 2B). In patients with histologically confirmed BE (n = 28), six cases of nuclear positivity were found (Figure 2C). In 17/19 adenocarcinoma patients, PXR expression was observed in the nuclei of cancer cells (Figure 2D). This was significantly higher compared to nuclear PXR expression in BE tissue (P < 0.01, Figure 2E). Result of PXR immunohistochemical staining on esophageal biopsy specimens. (A) Esophagus of healthy controls is lined by a stratified squamous epithelium and is negative for PXR (200×). (B) The esophageal mucosa of patients with reflux esophagitis is damaged and inflamed and demonstrates a weak signal for PXR (brown) in the cytoplasm of epithelium (200×). (C) Barrett's epithelium is characterized by a single layer of columnar epithelium with the presence of typical goblet cells. Cytoplasmic as well as some nuclear PXR expression is observed (400×). (D) Cells of adenoma tissue show high levels of nuclear PXR expression (400×). (E) Quantification showed that the percentage of cases with more than 2% PXR-positive nuclei was significantly higher in EAC than in BE (P < 0.01). PXR mRNA levels were analyzed in HET1A and OE19 cells upon stimulation with 50 or 100 μM TLCA. PXR levels in the OE19 adenocarcinoma cell line were higher than in the squamous epithelial HET1A cells (P = 0.02), but mRNA levels did not differ between unstimulated cells and cells stimulated with TLCA (Figure 3A). Figure 3B shows immunofluorescence of PXR in the nuclei of OE19 cells that were unstimulated, or stimulated with TLCA. Induction with rifampicine was taken as a positive control. 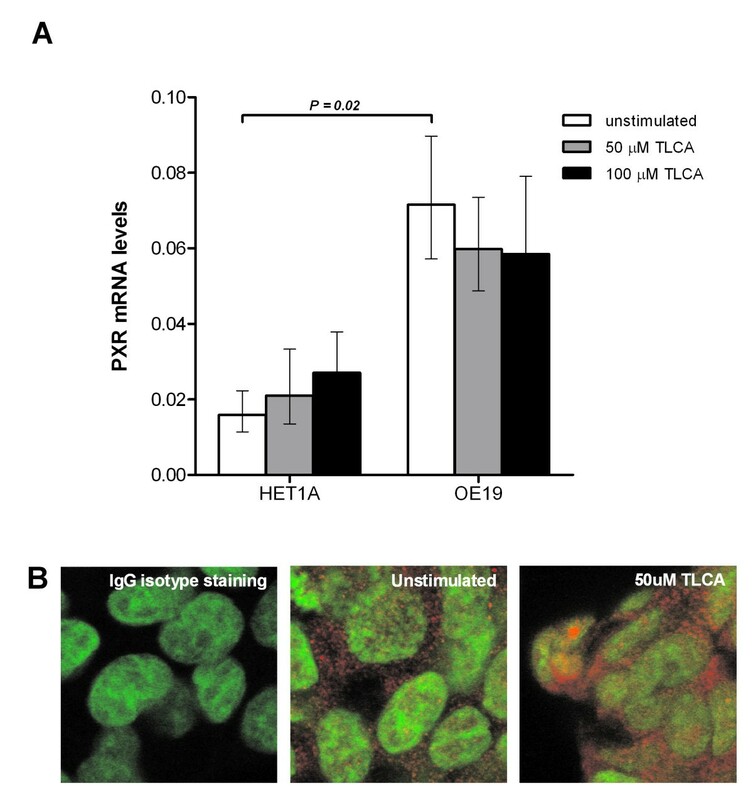 More nuclear PXR staining was observed in cells stimulated with 10 μM rifampicine (data not shown) and 50 μM TLCA compared to unstimulated cells, with most intense staining observed in TLCA stimulated OE19 cells. In summary, exposure of adenocarcinoma cells to bile acids and xenobiotics appears to induce nuclear translocation of PXR independent of its gene levels. PXR mRNA levels and nuclear translocation of PXR protein in esophageal cell lines stimulated with bile acids. (A) PXR mRNA levels are significantly higher in OE19 than in HET1A (P = 0.02). Bile stimulation with 50 μM or 100 μM of TLCA did not affect PXR mRNA levels compared to unstimulated conditions. (B) After immunofluorescent staining of PXR (red) and nuclei (green), localization in OE19 cells was visualized by a confocal laser microscope (1000×). In unstimulated cells, PXR was predominantly found in the cytoplasm. Upon 24 h of stimulation with 50 μM of TLCA, PXR translocation from the cytoplasm to the nuclei was observed. Polymorphisms at location 7635 and 8055 of the PXR gene have previously been found to be located in different linkage disequillibrium blocks and are thought to have an effect on PXR activity . In our cohort the PXR gene polymorphisms were in Hardy-Weinberg Equilibrium. No significant association of SNP -25385C/T with BE or RE was found (P > 0.5; data not shown). Allele frequencies of SNP 7635A/G and 8055C/T for patient and healthy control populations are listed in Table 3. Minor allele frequencies of these SNPs were in consensus with previous observations in European control cohorts [14, 24, 25]. Subjects carrying the SNP 7635G allele had an increased risk of BE (OR 1.36, 95% CI 1.03-1.79). In comparing genotype distributions, an increase was demonstrated in the minor allele frequency among BE patients as compared with RE patients and healthy controls for both 7635A/G and 8055C/T. For SNP 7635A/G this trend was statistically significant (P = 0.037, Figure 4). Genotype distributions of PXR polymorphisms across populations of healthy controls (HC), patients with reflux esophagitis (RE) and Barrett's esophagus (BE). The distribution of AA (white), AG (gray) and GG (black) at locus 7635 of the PXR gene are depicted per patient group. As the pathologic condition of the esophagus progresses from healthy to RE to BE, prevalence of ancestral homozygous genotype decreases (P = 0.037). The precise pathophysiological mechanisms causing BE is still unclear, but the combination of gastric acid and bile acids from the gastroduodenal reflux is commonly acknowledged as the key factor in the development of BE . At low pH, bile acids are thought to cause esophageal mucosal injury, which has been substantiated both in vitro and in animal model systems [27–29]. The NR1I family of orphan nuclear receptors are known to prevent toxic accumulations of xenobiotics within cells by regulating a broad range of cellular transporters [17, 30, 31]. The nuclear receptor PXR is a member of this family and functions in the enterohepatic organs as a detoxifier and regulator of bile acid homeostasis [12–16]. It can bind a variety of bile acids [32, 33] and subsequently regulate the expression of a multitude proteins that transport bile acids across cell membranes [34–36]. These include the multidrug resistance (MDR)1 gene [37, 38], which encodes the efflux protein P-glycoprotein that removes xenobiotics from cells . Other bile acid transporters that are induced by PXR include the multidrug resistance associated protein (MRP)2 and 3 [40–42] and the organic anion transporting polypeptide (OATP)1 and 2 [42–44]. From studies in mice it was concluded that the function of PXR is of particular importance when bile acid concentrations reach pathophysiologic levels [33, 45]. PXR expression is known in healthy liver and intestinal tract, but in cancer it has yet to be explored. Therefore, in this study we investigated the expression and significance of PXR in esophageal pathology. We did not detect PXR in normal squamous epithelium or in the squamous epithelium of RE patients. PXR did however express at both mRNA and protein level in columnar epithelium, and was significantly lower in adjacent squamous esophageal epithelium of the same patient. In samples from adenocarcinoma patients PXR was clearly observed the nucleus. PXR mRNA levels between BE and EAC do not differ, but nuclear PXR protein expression does increase in EAC. Perhaps, this is an effect of difference posttranscriptional modifications between the stages. It could also indicate a translocation from the cytoplasm to the nucleus occuring during progression from BE to EAC, as our studies showed translocation from cytoplasm to the nuclei of adenocarcinoma cells in vitro after stimulation with rifampicine or litholic acid. These processes and their significance to PXR function need to be further explored, and a first step in this could be Western blot analysis on subcellular fractions of BE and EAC cells. Previous studies have suggested that PXR expression in cancer cells can interfere with the metabolism and responsiveness to chemotherapeutics, such as irinotecon and tamoxifen [46, 47]. They suggest this drug resistance involves the metabolizing enzyme CYP3A4, one of the key target genes of PXR . These effects on the metabolism of anticancer agents are especially important considering that PXR ligands include endogenous steroids and bile acids, as well as numerous environmental chemicals and dietary constituents. It has yet to be investigated whether higher levels of PXR in the esophagus also affects responsiveness to chemotherapy. Given the relatively low rare allele frequency for SNP 8055C/T, our population size may have been insufficient to detect a statistically significant association. Validation of our findings will require a well-characterized population from a multicenter study. Recent studies associate PXR polymorphisms with other pathogenic conditions of the gastrointestinal tract, such as inflammatory bowel disease  and primary sclerosing cholangitis . Since associations with the two PXR SNPs in this study are in line with previous findings in IBD , this draws attention on a possible link of the functional effect of these SNPs with chronic inflammation. It is well known that inflammation, through the activation of NF-κB pathway leads to a decrease of CAR, PXR and RXR-alpha expression and the expression of their target genes. In addition, it has recently been shown that the mutual repression between PXR and NF-κB signalling pathways provides a molecular mechanism linking xenobiotic metabolism and inflammation . Although it cannot be ruled out that the observed link between BE and PXR levels is not the cause but only the consequence of the metaplasia from squamous to intestinal-type mucosa, the link with PXR-activity associated SNPs suggest a active role of PXR in BE pathophysiology. Further research should focus on the biologic function of PXR in BE and EAC, especially because PXR protein expression was observed in only few nuclei in Barrett's epithelium whereas EAC tissue was abundant with PXR positive nuclei. Here, we chose LCA to study nuclear translocation as it is the endogenous ligand with the highest binding affinity for PXR. As supraphysiological levels of LCA were used to stimulate esophageal cells, further research will be required using extensive stimulation assays that mimick the in vivo situation by long-term repetitive stimulations with a mix of bile acids in physiologic concentrations as recently performed . For a complex disease such as BE, development and validation of representative animal models will be of great value to investigate whether PXR plays a protective role in the development of BE or if it has a detrimental effect on neoplastic progression. In summary, PXR which is normally not present in the squamous esophageal epithelium, is expressed highly in the columnar esophageal epithelium of BE patients and tumor tissue of EAC patients. At a protein level, this expression appears to be more nuclear in EAC than in BE. Upon stimulation with lithocholic acid, PXR translocates to the nuclei of OE19 adenocarcinoma cells. Together with the observed association of a PXR-activity associated SNPs and BE, this data implies that PXR may have a function in predicting progression and treatment of esophageal disease, though further studies are warranted to support this hypothesis. The authors would like to thank our colleagues of the endoscopy units for their help, and their patients who volunteered to participate in this study. We thank Petra de Ruiter for her assistance in confocal microscopy and Hans van der Valk for expert pathologic grading.